By Natlee Chetty, marketing manager, Endress+Hauser South Africa. “An explosion of art and science coming together to build a drinking masterpiece” – Urban Dictionary. The Urban Dictionary gives quite a poetic definition, which could actually lead to the overall reason for the popularity of craft beer. People absolutely love creative freedom in its many forms, and craft beer is more than just a pint – it’s the combination of taste, a place, an experience and a stylish art with internal attributes to indulge our senses. An artisanal beer-making tsunami has hit South Africa in the last few years. With 30% growth in 2015, followed by 35% in 2016, local craft beer sales are predicted to reach 18 million litres in the current year, generating a sales value in excess of R1 billion. Fascinated by the popular amber nectar, I sat down with Redrock Brewery’s co-founder and managing director, Alan Melville, to discuss what the ingredients of success are in the craft beer industry. Less than two years old, and Redrock Brewery is one of the largest microbreweries in South Africa. Natlee Chetty (left) and Alan Melville discuss the ingredients of Redrock’s success. “Our brewing philosophy is to produce absolute quality with absolute consistency,” explained Melville. All around the world craft beer drinkers are becoming more discerning. This means that quality will ultimately decide which breweries thrive. Craft beer drinkers are quick to lose their loyalty to a brand if the quality is not up to their standards. This also means that, not just quality, but consistent quality, is becoming increasingly important if any brewery wishes to stand out from the crowd. Having worked at the South African Breweries himself, Melville knows very well the quality requirements to building a successful microbrewery. The Redrock microbrewery was imported from BrauKon in Germany, which specialises in automation for breweries and sources its sensor technology from Endress+Hauser. “One of the reasons we chose Endress+Hauser is because it becomes so much easier to run a brewery with the right equipment, but we also needed good partners with strong relationships to help us grow and sustain our business,” added Melville. Brewing beer requires dealing with naturally grown products that change from harvest to harvest. The brewer needs to react to these changes to prepare a stable quality of beer, and even more, it must taste the same all year, each year, to fulfil the expectations of the customers. To follow this moving target, a lot of experience backed up by appropriate mechanisation and automation of critical functions is necessary. Endress+Hauser has an established reputation as a global leader in food and beverage automation, and over the years has come to understand the art of brewing. Redrock is fully equipped with state of the art sensor technology from Endress+Hauser. Increased accuracy of process sensors along with high repeatability enables the brewery to run processes in the most efficient manner. 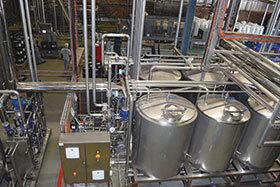 Reliable flow meters are required for the reduction of beer loss and boundary metering. The Promag H magnetic flowmeter is applied to accurately measure the transfer of wort/beer between stages in the brewery and to identify any beer losses. It is a multivariable instrument for flow, volume flow, temperature, conductivity, mass flow, corrected volume flow and corrected conductivity. The measuring principle is virtually independent of pressure, density, temperature and viscosity. Time-saving local operation without additional software and hardware is available via the integrated web server. The innovative Heartbeat Technology also allows online verifications to be done on demand, as often as needed. Detecting contamination is made easy with the phase-shift detection, which enables users to identify when the product has changed: for example, detecting when beer or caustic is present in the line. For higher accuracy measurement of liquids and gases under demanding process conditions, a Coriolis mass flowmeter can be used. This multivariable meter is able to provide information on mass flow, temperature, density, °Plato, °Brix, °Baumé, %concentration, viscosity and more. Full access to process and diagnostic information is available as well as integrated verification with Heartbeat Technology. Only quality measuring devices that meet the required hygienic standards can guarantee product quality, measuring reliability and optimum process safety, all at the same time. Another good example is the iTHERM TM411 thermometer, which is commonly used to monitor the temperature during the pasteurisation process. Temperature measurement and control during pasteurisation is of extreme importance, and has a direct impact on the taste and quality of the beer. A lower temperature can result in the risk of microbiological contamination and therefore poses a risk to consumer health. A temperature higher than required will affect the quality and taste of the beer, not to mention the additional cost of the wasted energy. The quality and safety of the final product depends on fast and accurate temperature measurement for exact and reactive process control. Specially designed for use in hygienic applications in the food and beverage industry, the iTHERM QuickSens is among the fastest temperature sensors in the world (t90s: 1,5 s). The TM411 with QuickSens and QuickNeck technology, allow for quicker detection and faster reaction to temperature changes. The innovative technology also allows for shorter immersion lengths compared to standard inserts. The TM411 has excellent long-term stability and, combined with simple and fast recalibration via QuickNeck, results in time and cost savings. As with all craft beers, innovation is an essential part of the product range. Whilst Redrock uses age old science and techniques, the Master Brewer’s ‘art’ is a unique combination of ingredients together with consistent and efficient brewing processes. The use of technology to improve quality, enhance flavour and improve aromas in the beer enables this wholehearted creative expression to delight the palate in an unforgettable sensory experience.